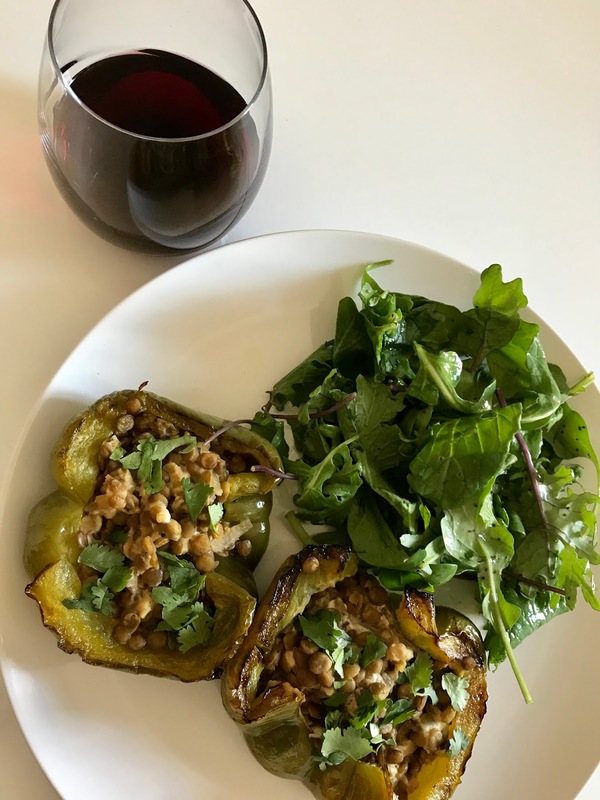 As I mentioned in my intro post, I love vegetarian food, but unfortunately it is notoriously difficult to pair with red wine. While I thoroughly enjoy white wine, sometimes I really just want a red! Many people choose Pinot Noir with vegetables thanks to its high acidity, low tannins, and light body. However, it is a super finicky grape that can cost a pretty penny! So what's a budget-conscious red wine lover to do? 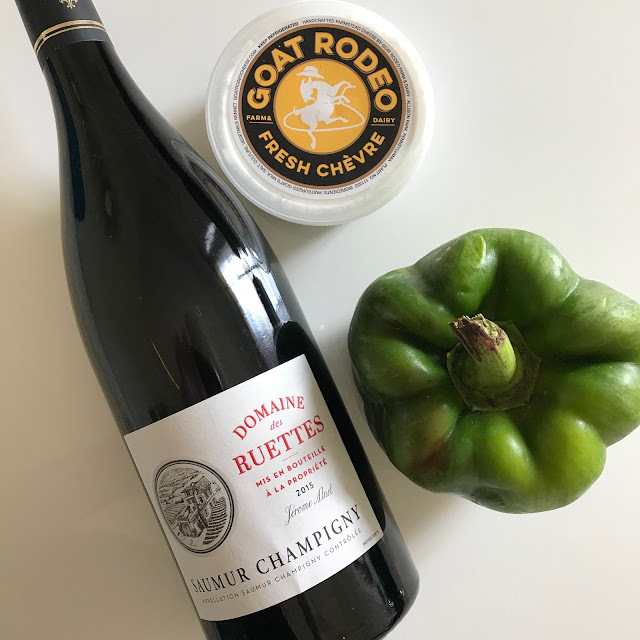 For this week's Meatless Monday, let's head to the Loire Valley in France to check out the veggie-friendly Cabernet Franc. The other Cabernet: Cabernet Franc and Sauvignon Blanc are the proud parents of Cabernet Sauvignon. Cabernet Franc grows all over the world but it is best known for its role in the Bordeaux blending assortment. Places like California and Chile produce wonderful, warm climate Cab Franc that will pair nicely with meat dishes for you carnivores out there. For vegetarian dishes, I recommend seeking out cool climate Cab Franc (like the Loire) for its medium-high acid, medium tannin, and pleasant fruitiness. The flavor profile conjures red berries, green peppers, granite, and a little bit of chili spice. It pairs well with earthy flavors like mushrooms, eggplant, lentils, bell peppers, both fresh and dried herbs, and, my favorite, goat cheese. You can find satisfying bottles of Loire Valley Cab Franc for about $15. Cabernet Franc hanging out with some of its BFFs. I'll admit that sometimes I pick out my wine before my food. Priorities, ok? I knew I wanted my first "Veggies & Vino" post to be Cabernet Franc because this awesome bottle is currently on sale for $10.99. To my relief, my CSA came through with bell peppers and mesclun mix this week. With those items, a few pantry staples, and some Goat Rodeo fresh Chèvre, I was in business! Preheat your oven to 400 degrees Fahrenheit. Rub your peppers with half of the olive oil and pop them in the preheated oven for 30 minutes. While they are roasting, prepare your lentils according to the directions on the package. I like to add vegetable bouillon to the cooking water to give them extra flavor. In another pan, combine your onions, salt, and olive oil and cook until caramelized. Combine the prepared lentils and onions with the garlic, goat cheese, and Italian herb blend. Stuff your peppers with the lentil and cheese mixture and return to the oven for another 10 minutes. Garnish with any fresh herbs you have handy. I had cilantro from my CSA but parsley would be great. Serve and enjoy! I paired the peppers with a mesclun salad tossed with poppy-seed dressing, and of course, a glass of Cabernet Franc! Perfect for when you really need a glass of vino on Meatless Monday. I would love to help you pair your favorite foods with wine! Drop me a line with your dish of choice.